Make yourself at home in one of the 125 air-conditioned rooms featuring refrigerators and microwaves. Complimentary wireless Internet access keeps you connected, and cable programming is available for your entertainment. Bathrooms have shower/tub combinations and complimentary toiletries. Conveniences include safes and desks, as well as phones with free local calls. Make yourself at home in one of the 95 air-conditioned guestrooms. Complimentary wireless Internet access keeps you connected, and cable programming is available for your entertainment. Bathrooms with shower/tub combinations are provided. Conveniences include phones with free local calls, and housekeeping is provided daily. When you stay at Motel 6 Newport Beach in Costa Mesa, you'll be near the airport, within a 10-minute drive of South Coast Plaza and University of California-Irvine. This motel is 3.4 mi (5.4 km) from Segerstrom Center for the Arts and 6.7 mi (10.8 km) from Huntington Beach Pier. Welcome to the Crowne Plaza Costa Mesa Orange County. We are an upscale hotel that understands the needs of our corporate guest to be connected, comfortable, and recognized. Centrally located in the heart of Costa Mesa surrounded by Fortune 500 Companies, extensive shopping, hundreds of restaurants, the Segerstrom Center for the Arts, Golf Courses and beautiful beaches. Crowne Plaza Costa Mesa Orange County is convenient to the Arts: Renee and Henry Segerstrom Concert Hall, South Coast Repertory and The Performing Arts Center. Local beaches include Newport Beach, Huntington Beach, Corona Del Mar, Laguna Beach and Dana Point. Golf Courses nearby include Newport Beach Golf Course, Strawberry Farm's, Oakcreek and world renowned Pelican Hill Golf Course. We are within walking distance to Hyundai, Deloitte, IBM, Bank of America, Amen Clinic and GE. Crowne Plaza Costa Mesa is within 5 miles of Fed Ex, Wells Fargo, State Farm, University of California Irvine and Vanguard University. The hotel is adjacent to South Coast Plaza Mall which offers over 500 shops including Macy's, Gucci, Zara, Nordstrom, Jimmy Choo, Bloomingdales and Cartier, and a wide variety of dining experiences including Wolfgang Puck Bistro, Capital Grille, Seasons 52, Antonello Ristorante, and Morton's. Local Hospitals include Hoag Memorial Hospital Presbyterian, Orange Coast Memorial Medical Center, Children's Hospital of OC, Saddleback Memorial and Mission Hospital, Kaiser Permanente. Centrally located among beautiful beaches, fine dining, premier entertainment and exclusive shopping. 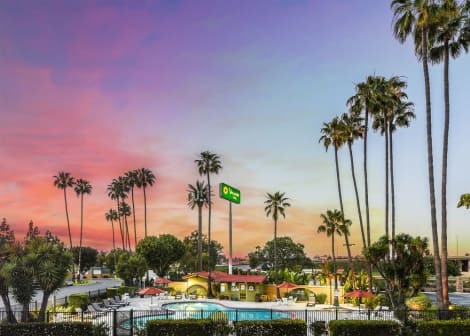 The Holiday Inn Express Costa Mesa Newport Beach is just over two miles from John Wayne Airport and easily accessible from the 405 and 55 Freeways, making travel a breeze. Business travelers can stay productive with free high-speed internet. Start your day off right with free breakfast at our Express Start breakfast bar. Enjoy our melty gooey cinnamon rolls, or decide to go extra-fit with cereals, yogurts, and a variety of breads. Hoag Hospital and the University of California-Irvine are only minutes from the hotel. Guests are encouraged to spend the day enjoying the sun and sand at Newport Beach or strolling along the streets of Balboa Island. Only .5 miles from the Orange County Fairgrounds. Hotel guests can take advantage of shopping at South Coast Plaza and even take the family to Disneyland® for the day since it's just a short drive away. Or visit the Time Nightclub or many restaurants and entertainment options at Triangle Square, just blocks away. For a refreshing break, take a swim in our outdoor heated swimming pool. For an invigorating workout, try our fitness center equipped with cardio equipment and free weights. Meeting space is also available for your next event. Plan your next trip to Costa Mesa today! With a stay at Ramada by Wyndham Costa Mesa/Newport Beach, you'll be centrally located in Costa Mesa, within a 10-minute drive of Huntington State Beach and Newport Pier. This hotel is 5.1 mi (8.2 km) from South Coast Plaza and 5.3 mi (8.6 km) from Fashion Island. Featured amenities include a 24-hour business center, limo/town car service, and express check-out. Planning an event in Costa Mesa? This hotel has facilities measuring 6500 square feet (604 square meters), including conference space. A roundtrip airport shuttle is complimentary (available 24 hours). Enjoy Californian cuisine at Palms California Bistro, a restaurant which features a bar, or stay in and take advantage of the 24-hour room service. Cooked-to-order breakfasts are available daily from 6 AM to 11 AM for a fee. lastminute.com has a fantastic range of hotels in Costa Mesa, with everything from cheap hotels to luxurious five star accommodation available. We like to live up to our last minute name so remember you can book any one of our excellent Costa Mesa hotels up until midnight and stay the same night.